Zoya for Creatures of Comfort at New York Fashion Week fall/winter 2017. When I see muted, dusty tones like the ones above, I think ’90s — when grunge was the style, waif was the look, Stella Tennant the model-of-the-moment (other than Kate Moss, I mean). Bright was out; faded was in. Anything sparkly, glittery, or (gasp!) pink was verboten. Basically, my entire wardrobe was varying shades of beige. So I had serious flashbacks when I saw the color palette for Creatures of Comfort’s nail look during New York Fashion Week. Dubbed “Nature’s Pinwheel,” the look was a kaleidoscope of muted tones varying from khaki to dusty rose. 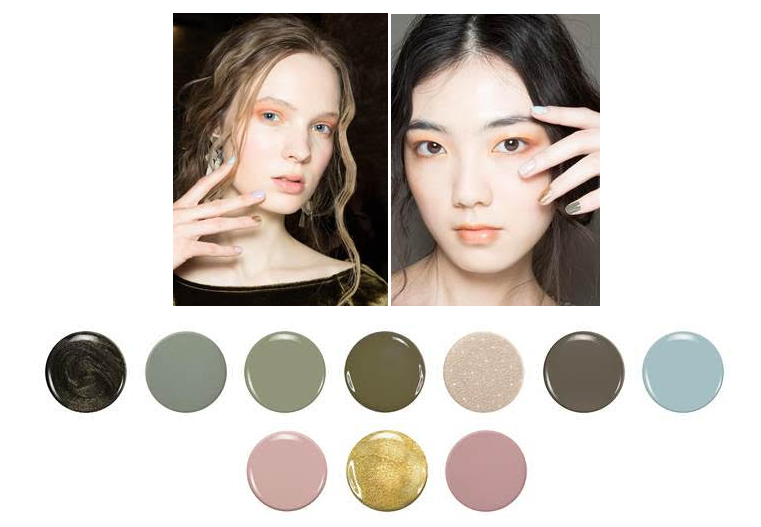 Naomi Gonzalez for ZOYA created the look, saying, “The inspiration is going back to basic beauty and taking from nature, greenery, and Zen.” Think Out of Africa with Meryl Streep. But what really made the nails modern? Pairing them with graphic sunset hued eyes and lips. Gorgeous.